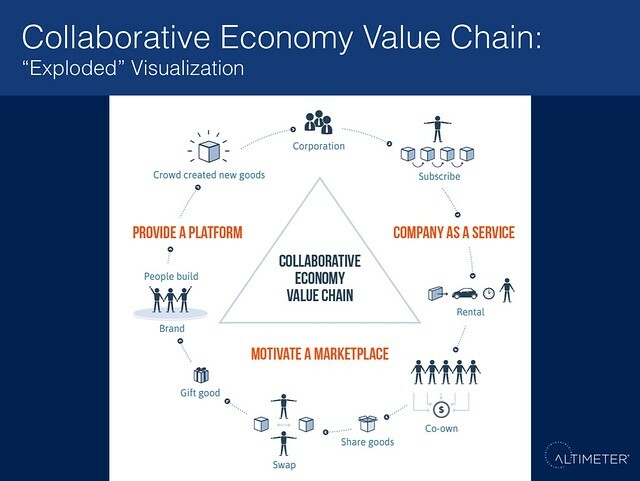 Above Image: An advanced view of the Collaborative Economy Value Chain in an ‘exploded’ view. This exclusive image, which was not included in the seminal report on the Collaborative Economy, shows a potential new business model that taps into new transactions beyond traditional selling. In the final phase of “Provide a Platform,” the crowd is building new products. First, it’s key to read the full report and watch the 18 minute video of the highlights of the research report, the Collaborative Economy. The report defines the movement, gives quantified examples of disruption, indicates the three market forces that are driving this trend, and offers solutions for corporations who must adopt the value chain. Once you’ve done this, we can explore the advanced model (above), which proposes a hypothetical model that we created in the market where new forms of transaction emerge and the end state is where the crowd starts to design and build the company’s products. Exploring the Above Graphic: The Collaborative Economy Value Chain (Exploded View). Starting at the top at the products and moving clockwise, let’s explore the three major use cases of the Collaborative Economy for corporations. In each phase, a shift is required as products become services, services become marketplaces, and marketplaces build products. I have named each of these phases, and then I have given real world examples of these phases already happening. In the table below, I give further definition to the transaction types at each phase. In Company as a Service products become services. In this advanced model, companies move beyond traditional selling and transform their products to services. I call this, “Company as a Service.” To date, both BMW and Toyota are renting their cars from their dealership lots in San Francisco in order to serve the growing car-sharing trend. For those familiar with Netflix or Salesforce, this business model isn’t new, and it’s a good entry point for corporations. In Motivate a Marketplace services become a marketplace. Companies evolve their services to an entire marketplace, called “Motivate a Marketplace,” which taps into peer-to-peer markets that are already trading goods and services a traditional company involved. The difference here is that corporations must join this marketplace, rather than stand aside and be disrupted. One notable example today is Patagonia, which partnered with eBay to encourage customers to buy used goods, rather than buy new. In Provide a Platform, marketplaces build your products. The last phase, where marketplaces shift to products, means that corporations allow the crowd to collaborate on core business functions, such as design, funding, marketing, development, production, delivery, and sales. We’re already seeing examples emerge in pieces (Kickstarter for funding, Etsy for production, Quirkly for development, and Deliv for delivery). I see copious, open, market opportunities for brands to transform their businesses by being involved in the Collaborative Economy. Now that we’ve identified the phases in the Collaborative Economy Value Chain, we are free to explore the many transaction types that have already emerged in the industry. I’m thankful in particular to Neal Gorenflo, the founder of Shareable Magazine (the premiere media site in this space), who spent a few afternoons with me to map out the transaction types during my research process. The table below was featured in the appendix of the report. Sell Not new — but more and more individuals are empowered to provide goods and services directly to consumers online. Crafters sell their wares on Etsy; virtual workers get hired on oDesk and Elance. Traditional selling as we know it has morphed as disintermediation has occurred. Swap For no payment or a nominal fee, two parties trade goods or services directly. 99dresses allows women to trade fashion. HomeExchange facilitates home swaps. All goods and many services fit into this category. Counterintuitive: Let go of your company to gain the market. This macro view of how a corporation’s business model must change beyond the traditional selling model may be foreign to sellers of durable goods, CPG, retailers and wholesalers. When you look closely, however, large tech companies like IBM, Cisco, Microsoft, Salesforce and others are already activating many of these use cases. We expect that some companies will eventually incorporate at least one of these major use cases, but the really savvy ones will activate all use case scenarios to tap into their marketplace and glean a share of the new market transactions that are already happening without them. We looked closely and found that, on average, the sharing startups like Kickstarter or Uber are taking about a 20% transaction fee. We believe corporations can do the same. Without a doubt, the biggest challenge is the of the major paradigm shift that is necessary for corporations to let go of old methodology. The only way for business leaders to advance to this phase is to “let go” of your company to gain the market.More: Read all my posts tagged the Collaborative Economy for additional information.